My little great-niece is going into kindergarten this fall and they need agenda bags so I thought I would make her one to carry all her important papers home from school and back again. She loves cats and so I thought why not put on some applique and check out the applique stitches on the Pfaff Passport 2.0. Thank goodness for sewing machines with the blanket stitch because I am afraid that my hand blanket stitch is a bit dismal. The bag needs to be large enough to hold a scribbler with a bit extra fabric at the top to pull tight so nothing falls out. The size of this little bag is approximately 11 x 14 inches. The great thing about these agenda bags is they can be customized – the child’s favorite color, design and so on. Adding their name makes it even more special. 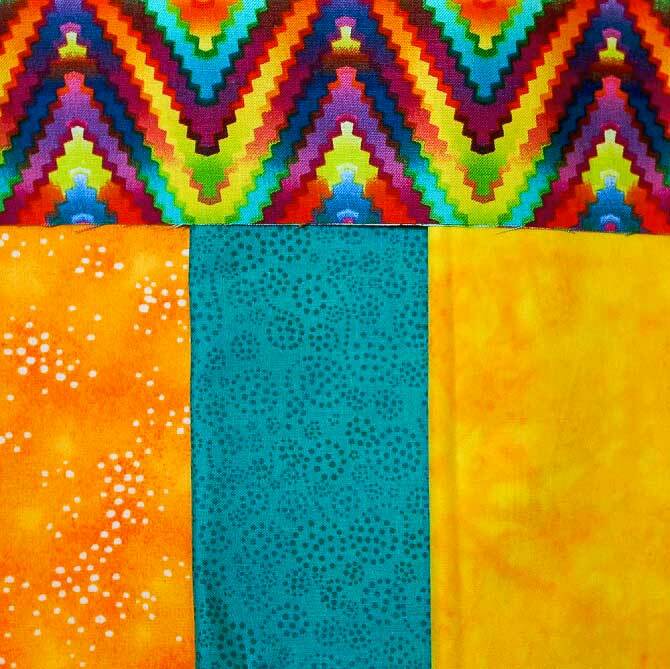 The fabrics I chose are bright and fun. The zigzag or ric-rac looking fabric I purchased at the beginning of the summer and could only get a half meter so am using in special projects only. I matched the rest of my fabrics to this one using a bit subdued fabric for the main bag and bright cheery fabrics for the applique. Using the two accent pieces press over approximately an ⅛″ of fabric on each end – the short side. Stitch down the folded edge very close to the raw edge as if topstitching. I recommend using a thread that matches the outside of the fabric in both the top and bobbin as this stitching line will show. I didn’t do that and when I noticed, it was too late to change it. Press over a ¼″ of fabric on one long edge of each piece. Fold over again about an inch and press flat. Topstitch about a ¼″ from the bottom fold to secure in place and create the casing. The ends of this section will be left open to thread the drawstring through. Sew each of these pieces to the top edge of the 2 main bag pieces. A quarter inch seam is not a must for this as there is plenty of fabric to take a slightly larger seam for added strength. If using directional fabric make sure to have it going the right way. 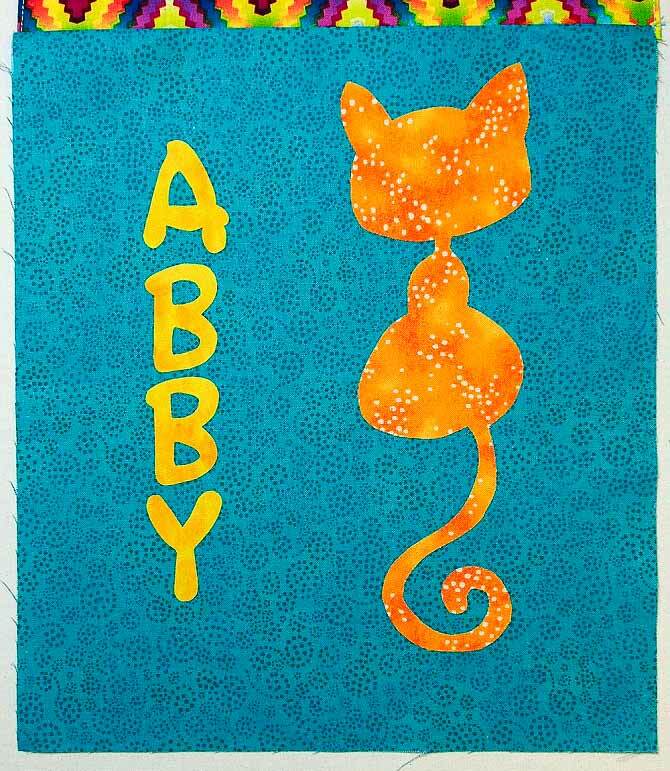 I tend to always work with fusible web when I am creating my appliqué designs and since I only do machine applique the fusible works perfectly for me. 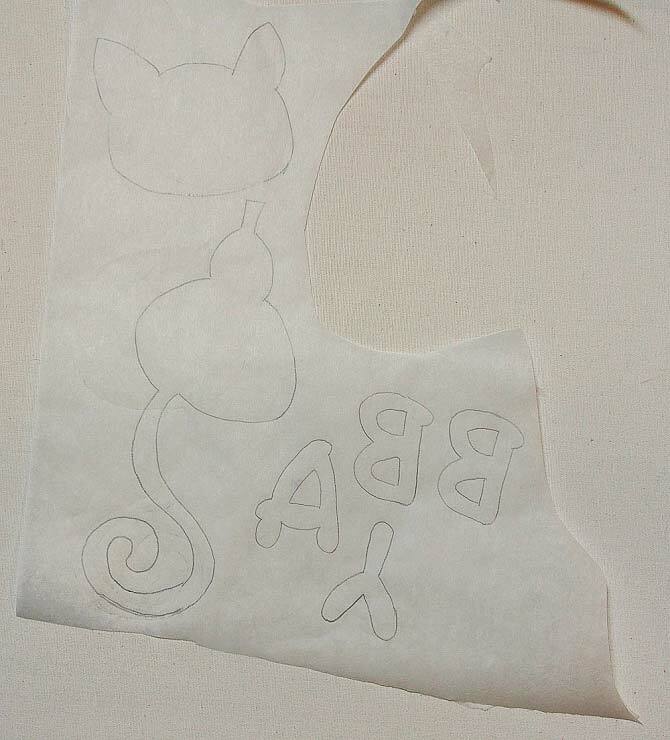 I chose my cat design and enlarged it on the photocopier then traced it onto the paper side of the fusible. I like to use a hard leaded pencil such as a 2H as the lead does not smudge and then there is no risk of getting lead on the fabric by accident. After tracing the design cut out the pieces about a quarter inch from the pencil line. 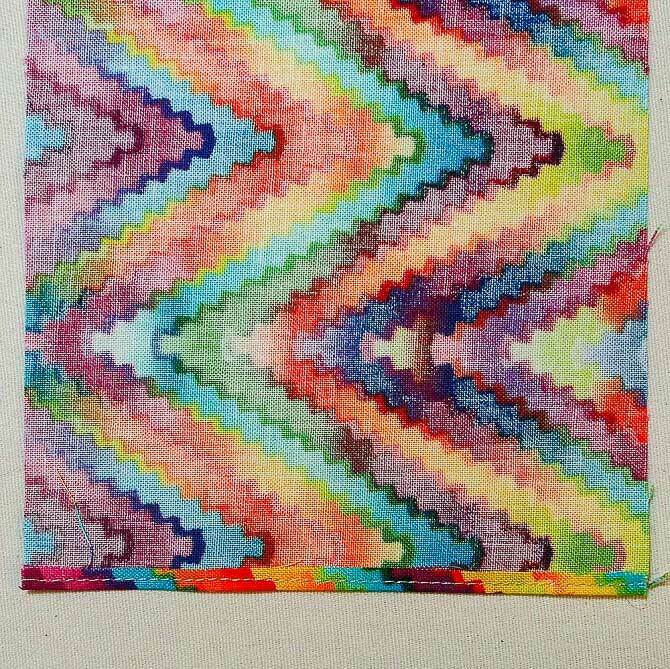 Fuse the pieces to the wrong side of the fabric following the manufacturer’s instructions on the fusible web. It’s always a good idea to cover the pieces being fused with an applique pressing sheet so that none of the fusible glue accidentally gets on your iron or ironing board as it’s very hard to remove. These sheets are usually made of Teflon and nothing sticks to Teflon. The best way to remove unwanted glue from the iron is to run your hot iron over a fabric softener sheet – and yes it really does work. Once the fabric has cooled, cut out the pieces on the pencil line and remove the paper backing. Place the pieces on the fabric being used for the front of the bag. Checking on the pull out card with the stitch menu on it I found the blanket stitch I wanted and punched in #26 on the keypad. The default size is quite large so I changed the width and length to be 2.5. 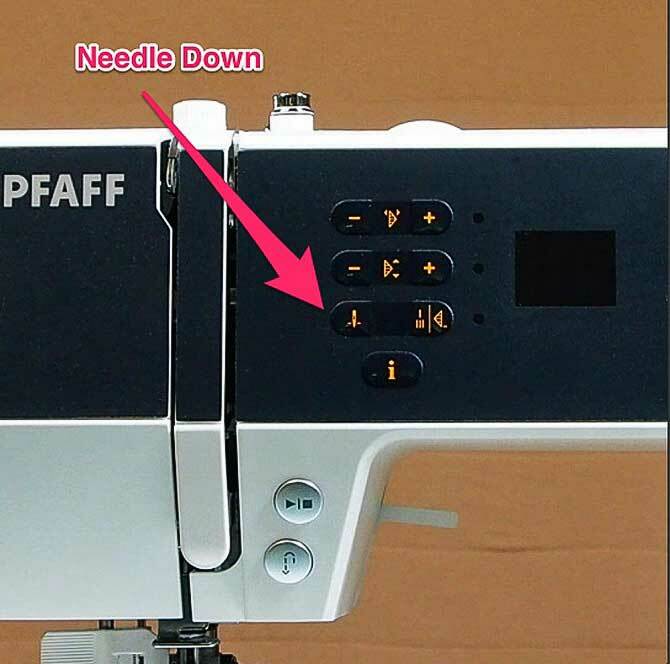 One of my favorite features of this machine is the needle down position which is a must have when doing applique. It’s always nice to leave the needle in the fabric when pivoting and turning on the applique shape to go around a curve or corner. The letters definitely required a bit of pivoting. I used an orange variegated thread from Wonderfil called Tutti for the stitching. 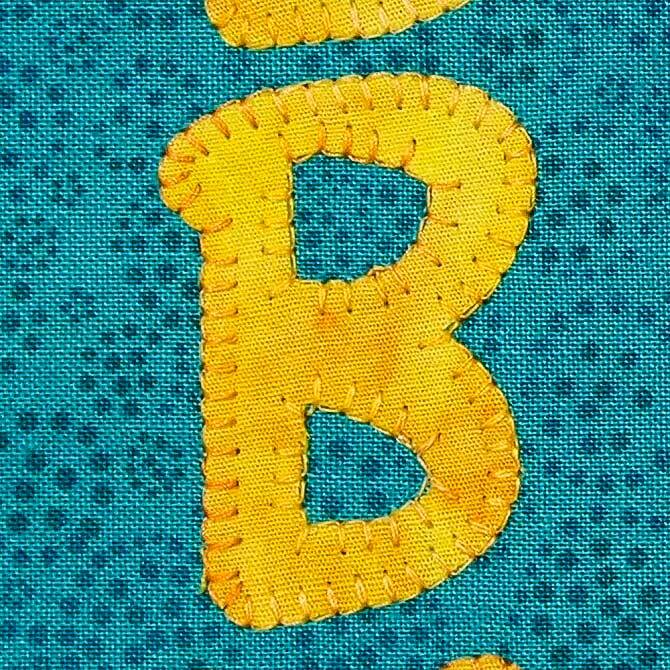 The blanket stitch on the letters turned out beautifully. The stitches are even and regular all the way around. I did use a tear away stabiliser behind the fabric to ensure that the stitches had something to catch hold on rather than just the fabric. Using a stabiliser whether it’s a leave in, tear away or wash away will create nicer looking stitches. I did find that I had to put the speed control down to the lowest speed in order to maintain control of my stitching around the little pieces. The speed control is a sliding button found on the left hand side of the machine body near the base. 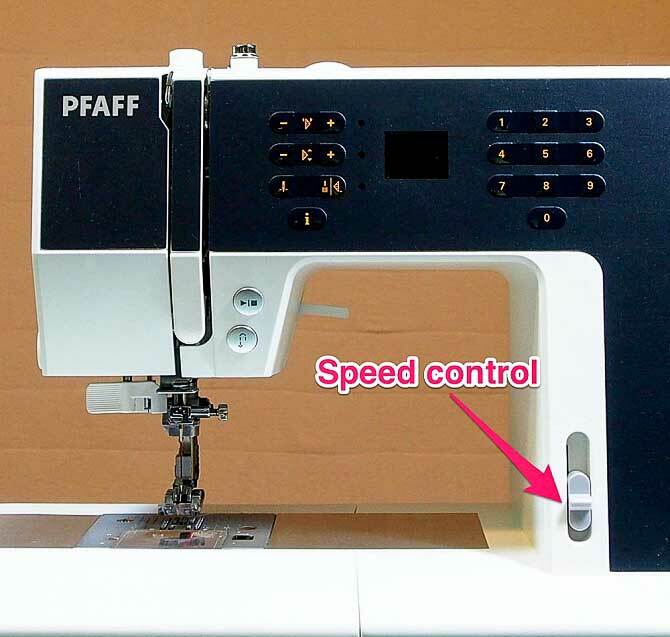 Having the ability to control the speed of the machine from turtle pace slow to speedy Gonzalez fast is great as we all like to sew at different speeds and sometimes slow is required while other times we can sew full out. I decided to use a different stitch for the cat. Join me tomorrow to discover what other applique stitches are on the Pfaff Passport 2.0 I’ll try as well as finish off the agenda bag.